Studio portrait of H Hansen either 1919 Private (Pte) Henry John Hansen 59th Battalion or 1709 Sapper (Spr) Harold Peter Hansen, 2nd Pioneer Battalion. 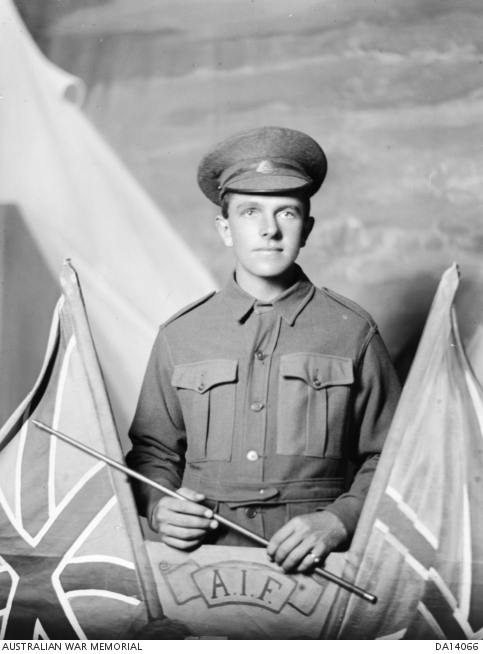 Pte Henry Hansen, a bedstead maker from Rozelle, NSW prior to enlistment embarked with the 3rd Reinforcements from Melbourne on HMAT Port Melbourne on 4 May 1916. He later transferred to the 60th Battalion and then to the 5th Machine Gun Battalion where, on 9 April 1918, aged 20, he was killed in action and was buried in the Villers-Bretonneux Military Cemetery, France. Spr Harold Hansen, a box repairer from Richmond, Victoria prior to enlistment, embarked with the 2nd Reinforcements from Melbourne on HMAT Aeneas on 8 April 1916. Following service on the Western Front, he returned to Australia on 5 May 1919. This is one of a series of photographs taken by the Darge Photographic Company which had the concession to take photographs at the Broadmeadows and Seymour army camps during the First World War. In the 1930s, the Australian War Memorial purchased the original glass negatives from Algernon Darge, along with the photographers’ notebooks. The notebooks contain brief details, usually a surname or unit name, for each negative.